The world is a noisy place and that includes the spaces we share at work. Though we can affect how much racket we make ourselves, other people’s work styles and the physical conditions that affect how loud or quiet the space is are usually out of our control. Read on to learn more about office noise, why it even matters, and the things we can do to change it even in our immediate surroundings. While open plan and collaborative office environments are designed for lots of activity, cubicle dwellers often suffer from the privacy illusion: It looks like you have space to yourself, but it sounds like you’re sitting in a train station. In an analysis of office attributes that cause the most frustration, ‘sound privacy’ is by far the worst culprit. 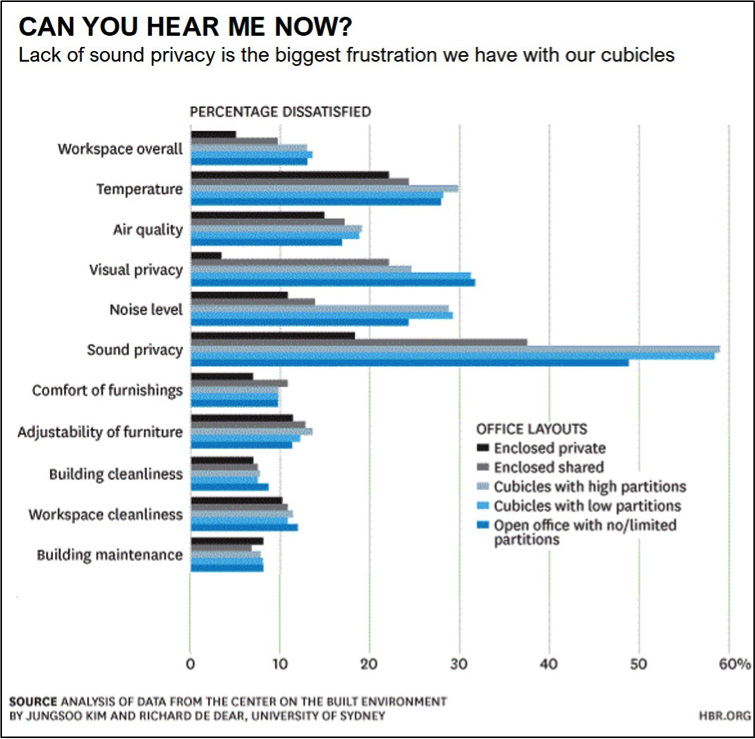 Surprisingly, the graphic above shows that folks in high-walled cubicles are more dissatisfied when it comes to sound privacy than those in low-walled or open spaces. This may be because the illusion of privacy makes noise that much more frustrating. But is Office Noise Really a Big Deal? Okay, so the world is a noisy place. But does it really matter how loud the office gets? Aren’t we (or shouldn’t we be) immune to it? Can’t we just tune out things we don’t want to listen to? Nope. There are good reasons to care about office noise levels, from base physiological effects right up to the corporate bottom line. Noise is a stressor. No matter what we may think, our bodies respond to loud sounds and prolonged racket at the deepest levels. Our blood pressure goes up and even our trusty old heart rhythm is affected. If the noise is loud enough, stress hormone levels rise and hypertension increases, leading to mental and physical fatigue. Noise reduces productivity. Concentration becomes harder when there are other conversations nearby, in part because our brain naturally engages with words it hears. That distraction takes away from our ability to focus on our own inner voice, making it harder to get and stay focussed. Noise can affect ergonomics. Workers exposed to prolonged noise, like that found in open plan and shared workspaces, are more susceptible to slouching and are less likely to straighten up and correct bad posture. This may be a result of the fatigue and distraction mentioned above but whatever the reason, unhealthy body position can lead to general discomfort and potential back and shoulder problems. Noise costs. 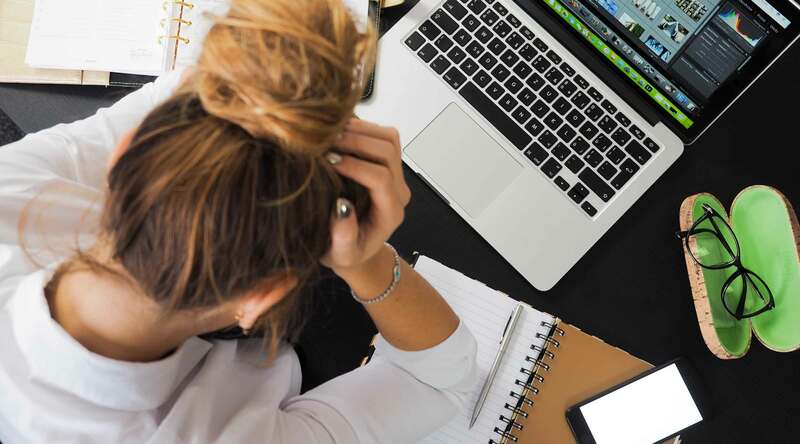 If we add up increased stress, lower productivity, and compromised physical health resulting from poor ergonomics, the final tally isn’t good for employers. Physical ailments add up to higher medical bills, and employee mental health takes a hit in the bargain. Okay, It’s a Big Deal. So What Should I Do? Can’t move your desk outside? Don’t despair! There are plenty of options for reducing noise and making the workplace more ear-friendly for all. Plan for quiet. 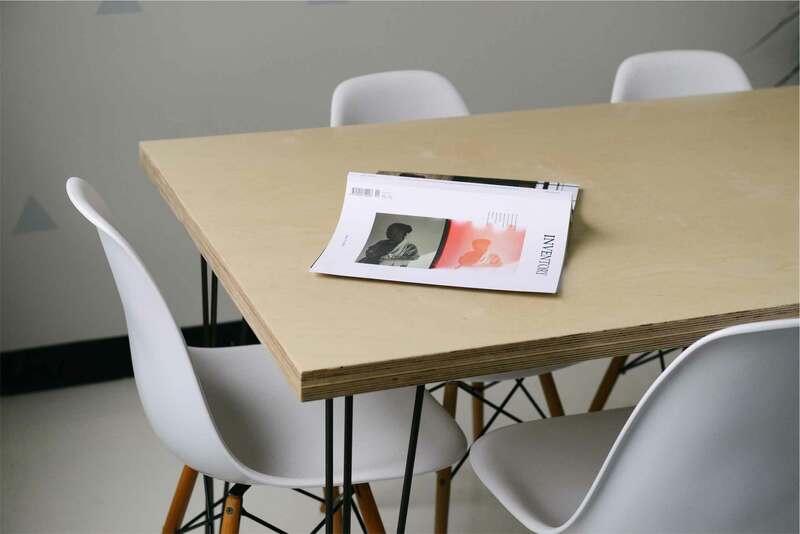 The easiest time to make a quieter office is at the very start, so start with space planning . 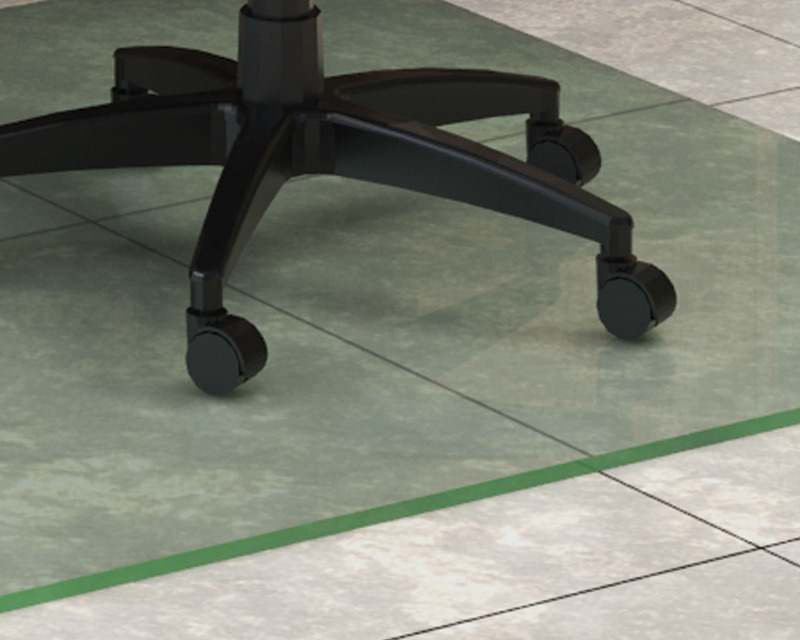 Stagger doorways so noise isn’t traveling from one cubicle into another, and create noisy work zones and quiet work zones with a little space in between. Soundproof walls and ceiling. Find office partitions and panel systems that use fabric or acoustical tiles to absorb excess sound. Corkboard is also a great DIY option that cuts down on echo AND gives you a place for your favourite photos. Carpet bare floors. 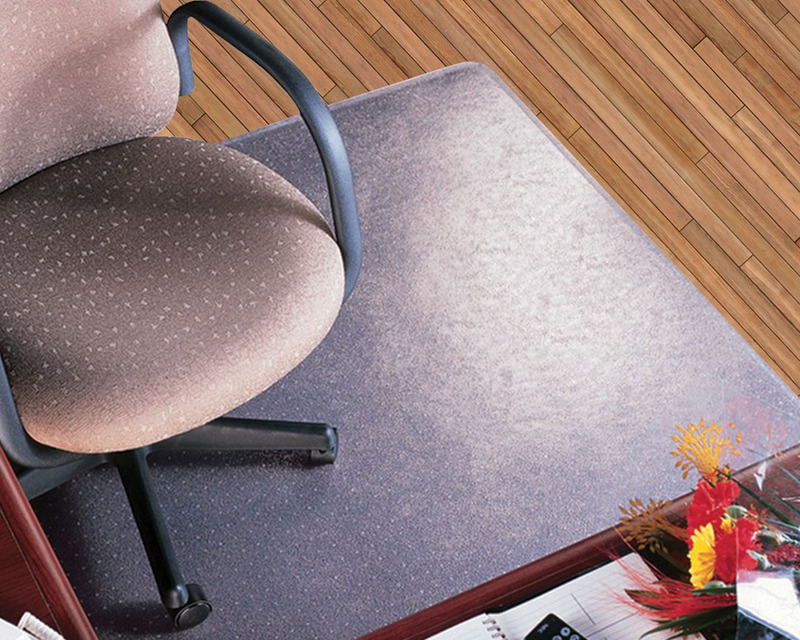 Add carpets to wood, tile, or stone floors to eliminate echoes and cut down on the chair castor noise. Extra tip? Keep a can of spray lubricant handy for oiling those squeaky wheels. Indulge in soft seating. Use upholstered office seating in your work and reception areas to help with noise reduction and enjoy the added perk of a more inviting place to sit. Use dedicated quiet space. If your office doesn’t have a designated ‘work sanctuary’, use an empty conference or meeting room (preferably with a door) to get away from the buzz. Consider booking the room for a set period of time to ensure you can work uninterrupted. Get a white noise machine. These ingenious gadgets, also known as ‘sound conditioners’, muffle noise and create a neutral audio landscape. White noise is also good for helping you sleep — though you didn’t hear that from us. Plants! Besides looking great and improving your health, plants have the added benefit of absorbing sound. The bigger the plant the better the impact, so find greenery that will do well in your office space. Noise-Cancelling Headphones. If you can’t stop the noise around you, at least stop it from reaching you. Noise-cancelling headphones create a sound wave that neutralizes the ones coming from other sources, offering you a little bubble of quiet bliss. For a free option, check out white noise apps that let you play white noise interference through your regular ear buds. 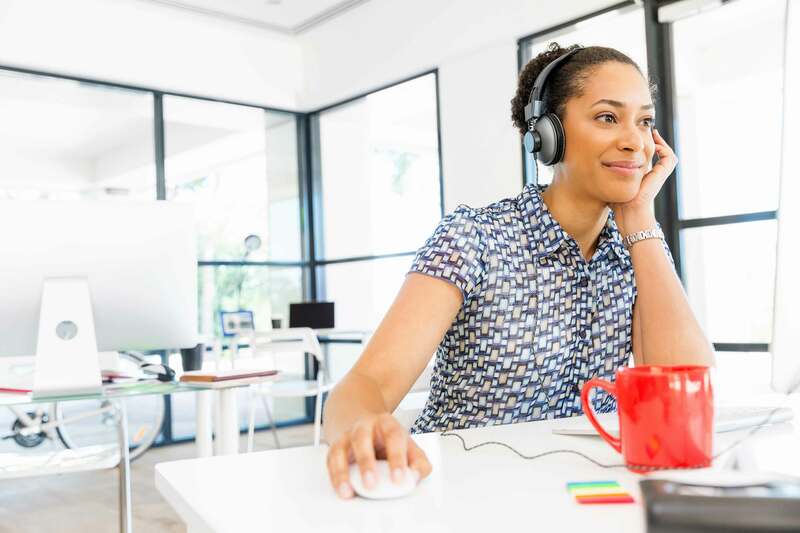 We can always use more ways to feel better in the office, so try these tricks for cutting down audio clutter and enjoy the (relative) silence.